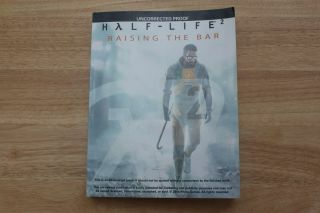 Half-Life 2: Raising the Bar is one of the finest videogame books I've ever read. It covers the early days of Half-Life, runs through the “mod movement” led by Counter-Strike, and then goes deep into the creation of Half-Life 2, with all sorts of concept art, notes from developers, and behind-the-scenes stuff like casting photos and discarded ideas. It's a hefty thing, too, nearly 300 pages in all, but according to a post in the Half-Life 2 Beta Project group on the Russian social network VK (via Half-Life Inside), it was originally envisioned as being even larger. The message says that a publisher's proof of Raising the Bar, recently purchased by a US fan on eBay, contains 100 pages more than the final release. Why they were cut is anybody's guess, but the buyer was nice enough to scan and post a few of them online. Some appear to be relatively minor adjustments to the final product—the first concept and in-game shots of Doctor Breen are in the release version of the book, although a different photo of the model was ultimately used—while other bits appear to be entirely new. Apparently not previously unseen, though: The ValveTime Twitter account posted a better copy of one of the images, “from our archives,” in the publisher's proof. It's cool stuff, and it sounds like more is on the way: The VK post says the new owner of the book plans to scan and post all of the unpublished pages.